“Body and Brain” looks at the physical and mental effects of alcohol. Much of the science of how ethanol affects us is still murky, though it seems clear that other factors in addition to alcohol are involved in intoxication. And if you want to learn why a bartender knows when to cut you off well before a Breathalzyer would, you’ll find the answer here. “Good mornin, sunshine! You are so screwed. The light coming in through the window is so…there.” Yes, we’ve reached the final chapter, “Hangover,” which offers us much to contemplate. Hangovers are generally painful, occasionally amusing (at least to the unaffected), and have a sizeable economic impact on society. A sample factoid: In the US, some $160 billion a year in productivity is lost due to people who can’t make it into work because of hangovers. Another bit of hangover trivia: 23% of people do not get hangover (“the scientific name for them is ‘jerks’”). But the most interesting thing by far about hangovers is that whatever you learned about them in college is not true. Apparently no one knows what causes billions of people to have hangovers, or how to treat them. The subject has barely been studied by scientists. You think your hangover is due to dehydration? Sure, drinking booze dehydrates you, but as various measurements of electrolytes and such show, that doesn’t cause the hangover (“Plus, drink a glass of water,” suggests Rogers. “Now you’re hydrated. Did your hangover go away?”). Acetaldehyde, blood sugar levels, lactate levels--none of these can (so far) be proven to cause hangovers. 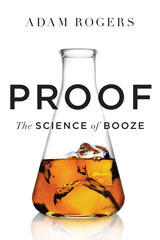 Proof’s final chapter is the only one that didn’t make me want pour myself a glass of wine, or beer or whisky, and I guess that’s a good thing. I was sorry, however, to finish the book. But with new yeast strains coming along (including some that make flavorful wine with lower alcohol levels); with climate changes, and different grapes and different viticultural regions emerging, and of course with genetically modified everything fast approaching; with small craft brewers and distillers multiplying everywhere--well, things are changing. In fact, concludes Rogers, “Maybe, even further in the future, something will replace ethanol altogether…an alcohol replacement that would have the same effects…but it’d be reversible, with an antidote that would instantly sober up a user, or cure a hangover.” Bring it on, I say, and bring on the book Adam Rogers will surely write about it.